Dunham and Konner already have already pulled together quite the staff for the project, which is currently self-funded. Lenny will be filled with writing from Dunham’s vast network of celebrity friends, but will also draw from its own staff — including...associate editor and Rookie writer Laia Garcia; and editor-at-large Doreen St. Félix, who has written for Pitchfork, The Hairpin, and BuzzFeed. 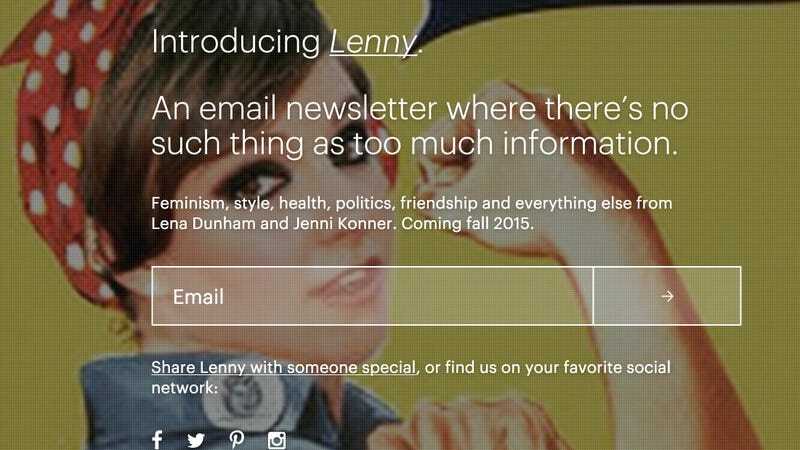 The newsletter will “eventually morph into a something of a website-letter hybrid” complete with “e-commerce that collaborates with independent female artists and designers in ethical, affordable, and witty apparel and design items.” Yes, Lenny plans on being and doing quite a number of things on its mission to become a Goop/Grantland hybrid—but one thing it will never be, they say, is hostile. “Women spend so much time trying to align themselves with an image in the media that they can’t match,” Dunham said, “that their hostility towards themselves and others becomes overwhelming.” To disrupt that hostility in a way that’s generative and generous, that’s exploratory and fun — that’s Lenny’s mission.